As a dietary supplement, take 1 VcapÂ® daily between meals or on an empty stomach. 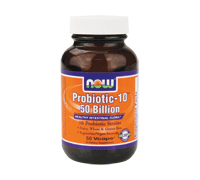 Â Consider taking this product in combination with NOWÂ® Fiber-3™ and Optimal Digestive System. Contains no: Â salt, starch, wheat, gluten, soy, milk, egg, shellfish or preservatives. Â Vegetarian/Vegan Product.